Echizen Ōno Castle is classified as a mountain castle (its layout: Teikakushiki), and is located in Fukui Prefecture. During the pre-modern age, it found itself within the borders of Echizen Province. It is associated with the Matsudaira, Doi clans. Dates in use: 1576-1871. 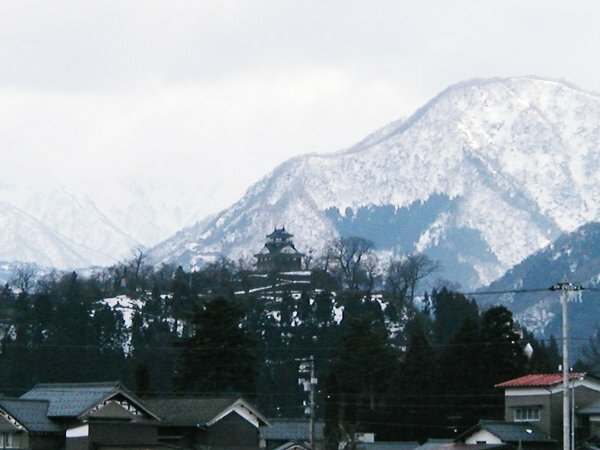 Oda Nobunaga awarded the Kanamori clan land here in 1575. Ownership then passed to the Echizen branch of the Matsudaira clan then finally onto the Doi clan. 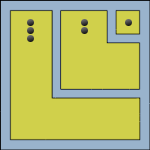 The Tenshu possessed a major and minor towers, both were twin layered but the larger had three internal levels. 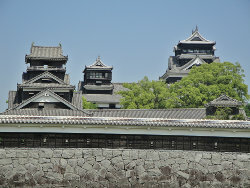 The smaller tower was known as the Tengu Turret. In 1775, the buildings of the main enclosure (Honmaru) met a fiery end, but the buildings of the second enclosure (Ni-no maru) & the third enclosure (San-no maru) continued to be used until they were finally decommissioned about 100 years later. 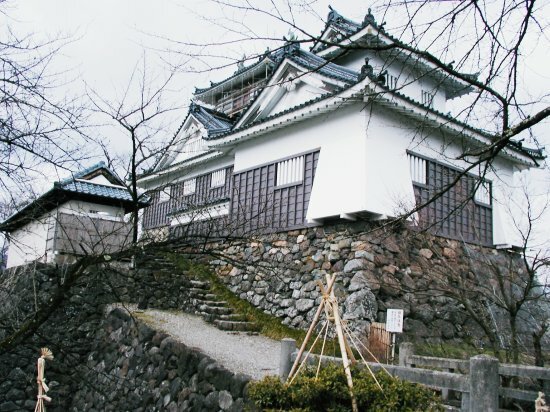 Echizen Ōno Castle is a ways off the beaten track, this is highlighted by the fact that public transport to and from the town aren't too regular. The castle can be seen from the train station so is within walking distance. 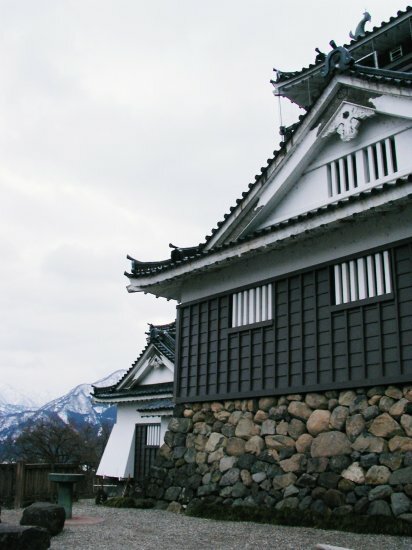 As is often the case with castles that were decommissioned after the close of Japan's feudal era, buildings & materials that could be reused, were. 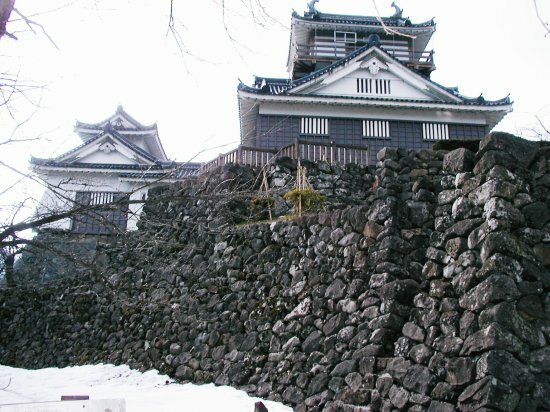 In Ōno castle's case, two gates were transferred to temples & have survived to the present day. A turret-topped gate, now located at the Kōmyō temple was severely damaged in 1948 and has since been repaired. One other gate, a small, Yakui-style gate, can also be found at yet another local temple. It is believed that both gates were built around in or around 1828. 1575 Kanemori Nagachika, a retainer of Oda Nobunaga, was awarded the fief following the defeat of the local warrioir monks & their supporters. The castle was constructed soon after. 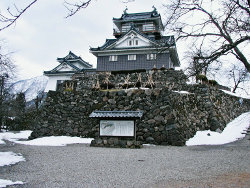 1583 The castle was surrendered to the Toyotomi clan after the battle of Shizugatake. 1586 Kanemori Nagachika was transfered to Hida Takayama. The Kanemori were replaced by the Echizen branch of the Matsudaira clan. 1684 The Doi clan were transferred here. 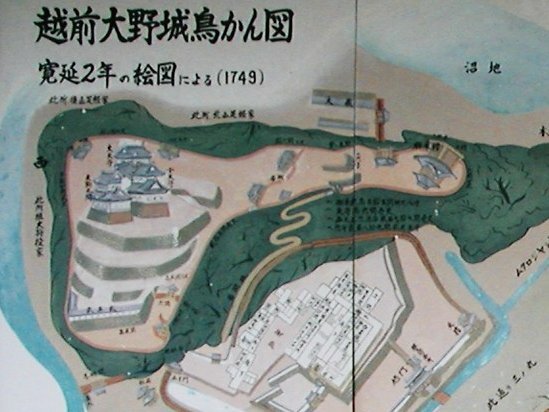 1775 A fire destroyed the buildings of the Honmaru, the main enclosure atop Mt . 1795 Buildings of the main enclosure, except the main tower, were reconstructed. 1968 The main tower was rebuilt using concrete.